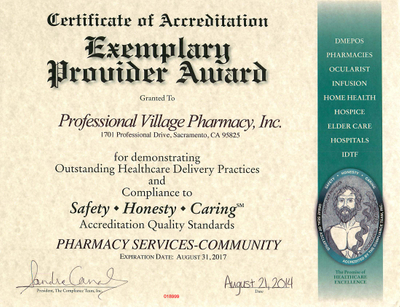 Professional Village Compounding Pharmacy is a full service compounding pharmacy that works with prescribers and patients to customize prescription medications for the Greater Sacramento region. A well-recognized and trusted name in pharmacy, Professional Village has been sought out by physicians and veterinarians since 1959. We know that every patient has unique needs and individual symptoms. We customize medication to address specific medical ailments. Backed with a complete inventory of FDA approved chemicals and formulas, our pharmacists compound most medications. Some of our specialties include bio-identical hormone replacement therapy, pain management, thyroid imbalance and veterinary preparations. Extensive training and the use of the highest quality raw chemicals in the industry allow us to compound with confidence. 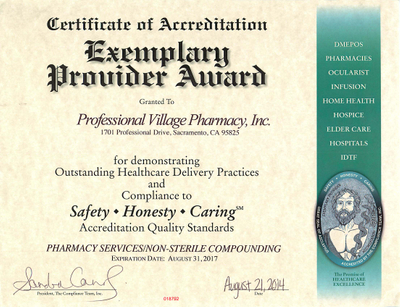 Find out why this is the compounding pharmacy that Sacramento trusts. Get in touch with our staff today to learn more about our pharmacy and medical supply services. "Serving the community since 1959, our commitment to meet and EXCEED your expectations, grows stronger every year. Our friendly and knowledgeable staff has the expertise, products, and services to help you reach your health care goals. We look forward to working with you."